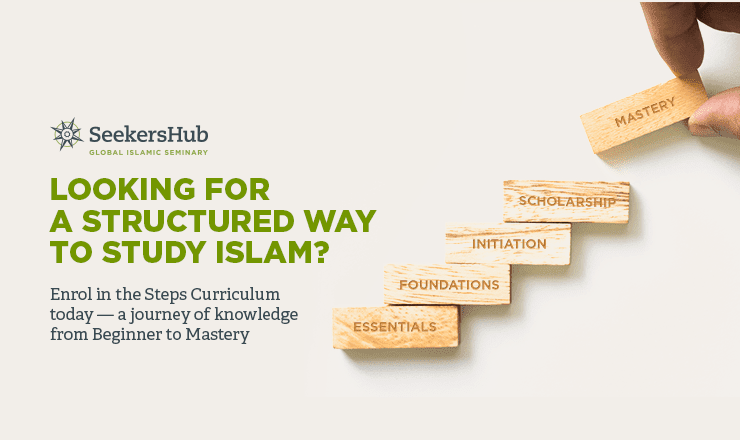 The SeekersHub Steps Curriculum allows you to navigate your journey from an absolute beginner in the Islamic sciences to scholarship and mastery. The curriculum is modelled on the traditional method of teaching the Islamic sciences in large mosques, as Imam As-Shafi did in Cairo, Imam Abu Hanifa in Kufa, and other great scholars all over the Muslim world. Students who attended these classes were arranged into a small inner circle of close and serious students,and much larger outer circles of less serious students, who flocked from all over the city, often even from all of the world, to listen to the great scholars. The teacher interacted with the two circles in different ways. The inner circle was allowed to ask questions. The outer circles were only sometimes allowed to ask questions during class, and sometimes not allowed to ask any questions at all, but would be reminded of Allah by listening to a great teacher. Everyone had the opportunity to benefit from great scholars like Imam al-Shafi’i or Imam Abu Hanifa. The inner circle were nurtured and mentored towards scholarship; the outer circles were guided towards veneration of the divine command. At the SeekersHub Islamic Seminary, our students are divided into three circles. 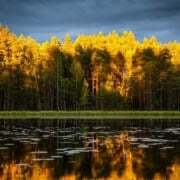 The first, outermost circle, are the beginner students, who listen to our teachers’ lessons for religious benefit and for the spiritual blessing (barakah) of being connected to gatherings of sacred knowledge. The second, middle circle, are the intermediate students. Intermediate students are fewer in number than the beginner students. They have demonstrated a commitment to studying sacred knowledge, memorising, reviewing, and sitting exams. They can thus benefit from our teachers in a way that beginner students cannot, and interact with them at a closer level than the beginner students. Finally, there is the third, inner circle of advanced students who have demonstrated an even higher level of commitment to studying sacred knowledge, and are on their way to scholarship and mastery of the Islamic sciences. These three kinds of students work their way through our five-step curriculum of Islamic sciences and our Arabic curriculum. All students begin with Step One, as well as some basic Arabic courses, as beginner students. Step 1 consists of eight courses that comprise of the personally essential knowledge that every Muslim must know. The basic Arabic courses teach basic Arabic reading proficiency, how to make a simple sentence, and some simple Arabic vocabulary. When they successfully complete all of these courses, they commit themselves to praying all five of their daily prayers on time, and earn the Essentials certificate. Once they earn this certificate, students can choose to become intermediate students by completing a comprehensive exam that tests them on their Step One courses, as well as their knowledge of the life of the Prophet (Allah bless him and give him peace), of the proper recitation of the Qur’an, and of the memorisation of some short Qur’anic suras. Going into Step Two, we now have two circles of students: beginner students and intermediate students. There are no advanced students yet. These two circles of students move forward by completing Step Two along with the SeekersHub Arabic program. (Arabic is not a prerequisite for Step One or Step Two, but it is for Step Three and Step Four). They learn the technical terms of each Islamic science. They learn the key questions of each Islamic science. They learn about the historical development of each Islamic science. The outer circle of beginner students listen to the lessons, complete carefully designed automated assessments, and ask questions. The inner circle of intermediate students receive closer personal attention, collaborating with their teachers as they complete case-studies in order to understand the course material at a higher level. If these intermediate students successfully complete Step Two and the SeekersHub Arabic program and make a commitment to a higher level of religious practice, they receive the Foundations diploma. They now have the choice of rising to become advanced students by completing a comprehensive exam that tests them on Step Two, as well as several courses of independent study. There are now three circles of students: an outer circle of beginner students, a middle circle of intermediate students, and an inner circle of advanced students. 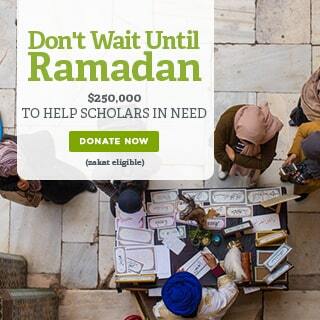 Steps Three and Four are geared towards this inner circle of advanced students—Step Three initiates them into the books of the Muslim scholarly tradition, and Step Four takes them to a level of general scholarship in the Islamic sciences. In Steps Three and Four, the beginner and intermediate students are grouped together into an outer circle–these students can join any course but their interaction with teachers is limited. The teachers focus their attention on closely mentoring the advanced students as they progress towards scholarship. It appears at this point that Steps Three and Four will comprise of over 50 online courses. 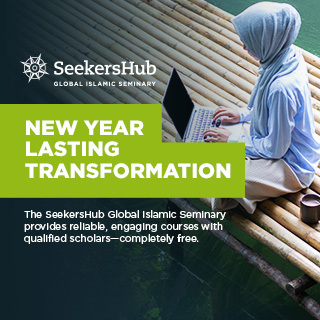 But advanced students will complement their online learning with in-person studies with teachers in their local area, or with in-person studies by travelling to learn with teachers at the SeekersHub Toronto Islamic seminary, or elsewhere in the world. Teachers, institutions of learning, and time for study are now scarce everywhere, and most full-time students of sacred knowledge are unable to complete a full curriculum in the Islamic sciences anywhere in the world. Through Steps Three and Four, students all over the world can fill the gaps in their learning by studying online whatever they are unable to do in-person. 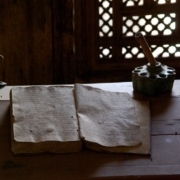 Students in Steps Three and Four study traditional commentaries on the mutun that they studied in Step Two. They now study all texts in their original Arabic. 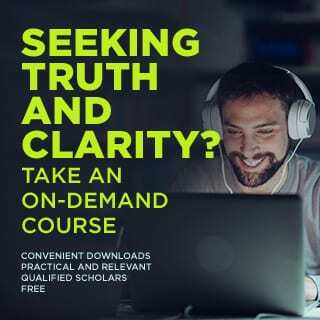 They learn how to understand the commentaries, use them as references, and apply what they reference to contemporary issues in a way that is consistent with the method and spirit of traditional Islamic scholarship. Advanced students who successfully complete Steps Three and Four will receive a degree of scholarship in the Islamic sciences. Full-time students who are on the SeekersHub learning scholarships are required to earn this degree in order to complete their studies. The learning of sacred knowledge never stops, and students can continue to acquire mastery and specialisation in particular sciences through Step Five of the SeekersHub curriculum. We pray that you are able to be a part of the SeekersHub Steps curriculum, and take a portion of the Islamic sciences and benefit at whatever level you are in. Registration is completely free. Click here to register. The Seminary Curriculum has arrived! Why Do We Need Scholars When There's Quran And Sunnah?